Japan for the existentialist reader. The story of how an Australian Samuel Beckett scholar and arts writer goes to Japan on spec and returns fifteen years later with a life and an alley cat. An intellectual leap ahead of most books on culture and the foreigner’s life in Japan. In this original take on the creative non-fiction genre, witty and elegant stylist Michael Guest “saunters” after the elusive spirit of Japan, discovering himself along the way. “Rarely is a reader granted such enlightened insights into the people and culture of Japan. Guest navigates the unfamiliar society and pervasive employment hierarchy to obtain a place at a national university and, eventually, a professorship. Guest’s intellectual disciplines of language and semiotics serve him well. Engaging and amusing vignettes of his interactions illustrate the character of the people brilliantly. Entrancing pictures of scenery, historic places and city life are superbly executed, complete with underlying context. 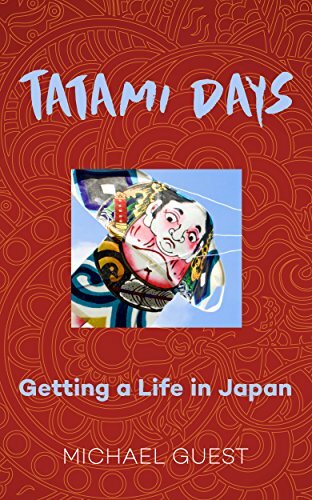 “A very human account of a stranger in a strange land, Tatami Days is a series of adventures coming to grips with Japanese people and their culture. From sake etiquette, funereal chop stick offences, temple practices, pachinko halls, and wonderful foods to Noh versions of Shakespeare and countering over-persistent editing supplicants, Guest takes us right into the Japanese psyche. Social mores, conventions, historical background and the underlying meanings of simple actions are explored and reflected. “I had a delightful time revisiting places I have read about in the great popularizer of Japan, Lafcadio Hearn’s, works in this text. No reader who truly loves Japanese culture will find any false notes here. The narrative pace and flow reflect subtleties reminiscent of a film director like Yasujirō Ozu, and Michael Guest draws his tight literary portraits from his experiences living and tertiary teaching in Japan for fifteen years.